Forum Index \ DriveHQ Customer Support Forum \ How to Browse older backups before restore? Subject: How to Browse older backups before restore? I have a daily backup. Apparently we got hit with one of thosse crypto viruses. The latest backup was just a backup of the encrypted files so is useless. How do I browse the previous backups to see if the previous day was infected before I go and restore 60G of files only to find they are encrypted as well? Subject: Re:How to Browse older backups before restore? 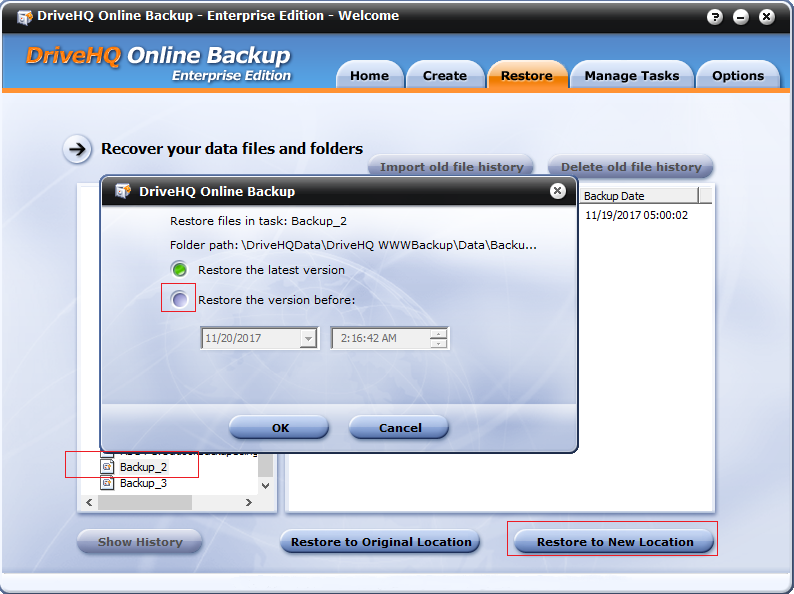 From your DriveHQ Online Backup software, click the Restore tab, then select a backup task on the left-hand side. Click "Restore to new location". If you know when you were hit with the encryption virus, then you can select "Restore the version before", and enter a time before the virus attack. Alternatively, you can navigate to a subfolder, and then right click on it and select "Restore to New Location".